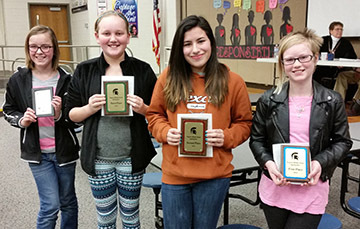 Students at Emporia Middle School and Turning Point Academy competed recently in school spelling bees and the top winners will to the Lyon County Spelling Bee. 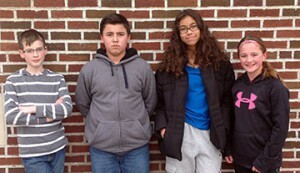 Turning Point Academy will host the county spelling bee at 10 am Tuesday, Jan. 27. The event will be broadcast live on KVOE radio, 1400 AM and 96.3 FM. EMS winners are: Anya Tollakson, sixth grade, first place; Izzy Alvarado, eighth grade, second place; Payten Redeker, seventh grade, third place; and Bailee Kinghorn, sixth grade, alternate. Turning Point winners are: Alessandra Vandiver, seventh grade, first place; Isaiah Pardo, seventh grade, second place; Cooper Glenn, sixth grade, third place; and Elleana Bennett, fifth grade, alternate.